SSC has released an update for candidate whose admit card is not downloading. 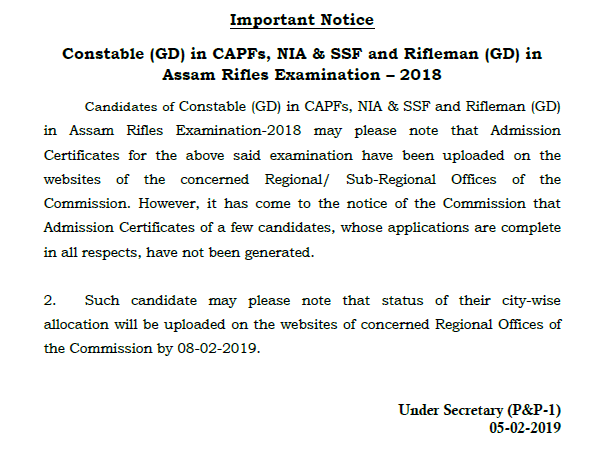 SSC GD Admit Card: Staff Selection Commission has released admit card update for Constable (GD) in CAPFs, NIA, SSF and Rifleman in Assam Rifles exam. Candidate who applied for any of these exam, their application is complete in all repect and still not able to download their admit card. Such candidate may please note that status of their city-wise allocation will be uploaded on the websites of concerned Regional Offices of the Commission by 08-02-2019.